Let me preface this by saying that I do not come from a religious background. I am Canadian, and white, and went to Sunday School as a kid, so you could call me Christian, although I could barely recite the story of Jesus’ birth to my kids, nor can I tell you the difference between Greek Orthodox or Catholics or Christians. I am not associated with Palestine or Israel, nor do I identify as Jewish or Muslim. I am a lover of learning. I have a degree in History although the Middle East was not my area of study. I am however, even more confused about the Middle East and the land that is currently called Israel and the Palestinian Territories. I am confused at WHY governments do what they do, why militaries do what they do and WHY there is SO MUCH HATE. I am confused today why rockets are being fired from Gaza into Israeli land. I understand the desire fight back. Last week I came home from the Middle East. 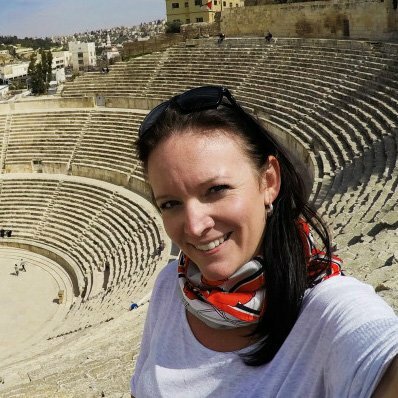 If you have been reading my posts for awhile, I have spent a lot of time in Jordan over the past few years, but not any time in neighbouring Israel or the Palestine Territories. 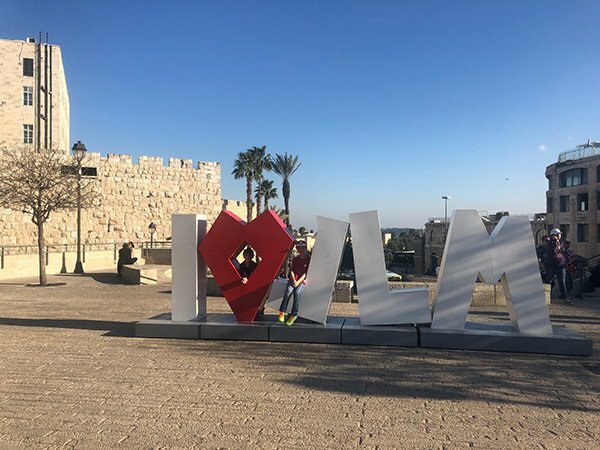 It was about time I got some perspective on what it would be like to visit Israel. We crossed by land at the Allenby Crossing / King Hussein Bridge (that has a blog post coming) and took a mini bus (called a shared taxi or sherut) into Jerusalem. Passport in hand, we crossed out of the West Bank without incident. No one came in the van to see who we were and ensure we were the right people going to the right place. It dropped us at Damascus Gate, a few kilometres from where we were staying (Abraham Hostels – a post coming up about our time there too!). Pretty uneventful. My first impression near Damascus Gate was that it was similar to cities in Jordan, albeit a bit cleaner, with fruit vendors and restaurants and small shops and PEOPLE! Lots of PEOPLE! Bread outside the Old City. 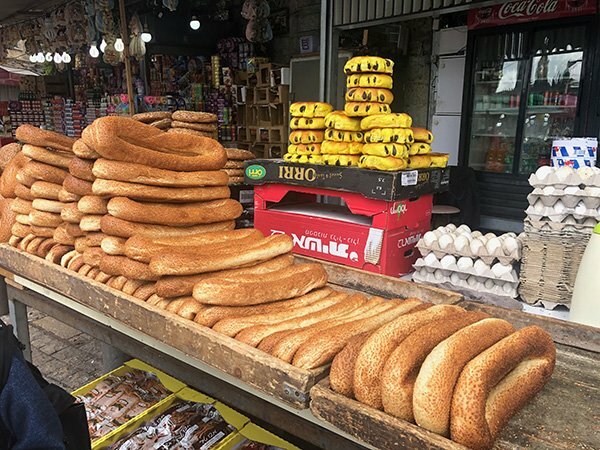 Jerusalem has amazing breads! I did not know if I was in East Jerusalem or West Jerusalem or even WHAT the difference was! 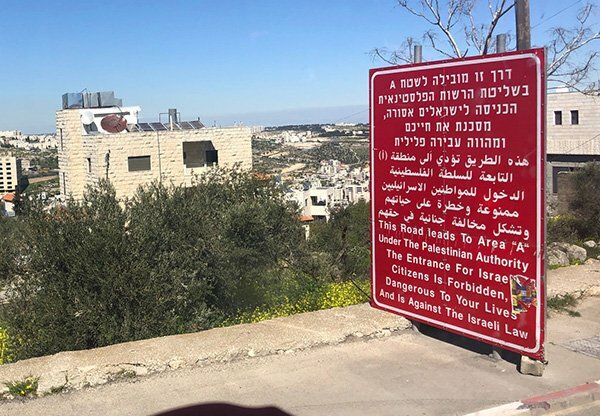 I know there is Israel and I know there is the West Bank, but how does a small pocket of Palestinian land fit into the city and where exactly is it. How do you get into it? Or OUT OF IT. All I could find on a map was what is known as the Old City, an area containing important religious sites for Christians, Jews and Muslims. So after wandering around for about 30 minutes, and getting a feel for the few blocks, we hopped in a cab and arrived into our Hostel. 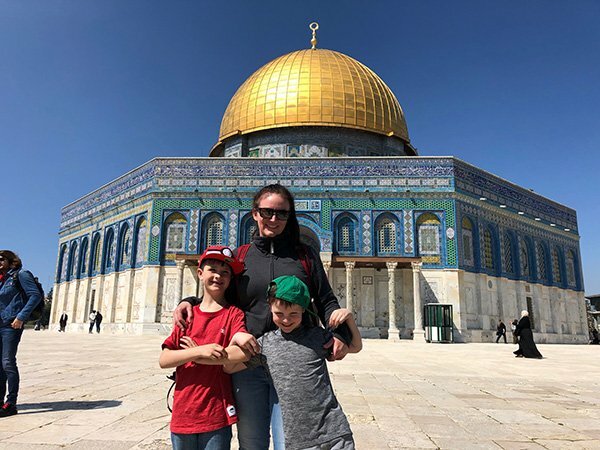 We had a tour the following day of the Old City of Jerusalem, I hoped I could find out more then about how confused I was about the whole place! So here is why I feel so confused. I live in Canada, we are a country built on immigrants, and although there are a lot of people of my parent’s generation who think just white immigrants should come to our neighbourhoods, I believe the vast majority of people my age, as well as my children, are very accepting of anyone who wants to move here and make Canada their home. No one is about to kill their new neighbour because they do not have the same color skin as the old neighbour. Most of those people who call Israel home today are first generation immigrants. They have COME to this place to build a life. Should you force someone else to move because YOU want to live there? In my opinion, NO. Now there is no going back to before Israel was created. No one is going to back a war to kick the people who have immigrated to Israel out and give the land back to the Arabs who once lived there. Arabs is a confusing word, as it is not a group of those sharing the same beliefs, it is a group of people who live in the region and share traditions and language, they may be Christians, Muslims or Jews. So we, and when I say “we” i mean the collective world as humans, can’t give the land back. But why can we not build a peaceful place where a variety of faiths can exist and legitimate democracy can elect people from all facets of life? Why can we not have Israel as it stands, or a united Israel and Palestine as one nation, a nation of PEOPLE of multiple religions, beliefs with a common goal to raise their families and live? Why can that NOT Happen? Why does the government of Israel not sell water to those living in Palestine at the same rate? Some communities pay less (Israelis settlements in Palestinian land) and some pay more (Palestinian communities). Some have access to less and some have access to more. It is like my local electrical company saying since I live on this side of the street I have to pay 50% more for electricity. It makes no sense. Again I do not understand it. Whether or not the creation of the State of Israel was fair (with half of the land going to Israel and half going to Palestine) it was done over 50 years ago. The 1967 War saw a quick defeat of the Palestinians and a loss of a lot of land to the Israelis. And less than 20 years ago violence has ensued as Palestinians protest the occupation of their land by Israeli forces. Israel built a big wall around the West Bank. Shouldn’t that have been enough to pull their troops off the land and let Palestine Govern itself? Why does Israel still control the land inside Palestine’s borders? They recognize it as a sovereign nation, but still keep their army inside and control the resources underground. 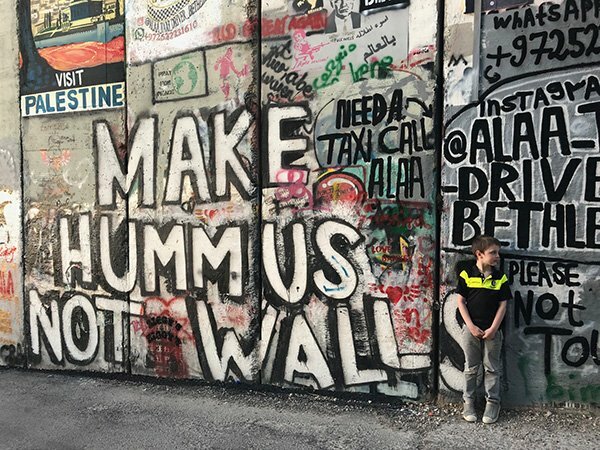 They built the walls well inside the borderline that was drawn to ensure that resources, farm land and important sites were on the Israel side of the wall. Even though it is Palestinian land. I 100% respect that Israel has the right to protect its borders. The United States wants to build the same type of wall to protect its borders against Mexico. If you accept the Palestinian land, why would you build a wall well into Palestinian land? And if you accept the land, why is Israel subsiding Israeli families to move into gated communities, called Illegal settlements from the Palestinian perspective and called Cities to those who live in them. Those people should be Palestinians, not Israeli citizens. If they want to live on Palestinian lands, they should become residents of Palestine. WHY does Israel accept Palestine, but then subsidize its citizens to move there? I mean no offence to those young families who are taking this opportunity to move there, but what is the cost to those who do NOT have the opportunity? Over 500 000 Israelis live in Palestine. But do not want to be part of Palestine, nor are they permitted to enter Palestinian cities. Palestine cities are most controlled by their own security. BUT around these cities, Israeli forces control most of the roads and can close them down if they deem a security threat. If they accept Palestine, why do they control most of the land? Why does the Israeli government want to control Palestine? While I was in Jerusalem, a 19 year old kid pulled a knife on an Israeli Military person (they are called the IDF and are stationed in Palestine, essentially controlling the area). Somehow got this man’s gun and shot and killed him. A manhunt was underway for this kid. The solder he killed was also only a kid, 21 years old I think. It took two days, but the Israeli Military found and shot the Palestinian. Now in neighbouring Jordan, this Palestinian was hailed as a martyr at the mosques at Friday prayers. He is a murderer. He took another man’s life. There is no other word for it. Thats MY VIEW. As a HUMAN. Not as a citizen of one country or another. ONE HUMAN BEING took ANOTHER HUMAN BEING’S LIFE for no reason. And again, I have no opinion on his nationality, his religion or where he calls home. But for the Jordanian Arabs, many of whom left their homes in 1947 in what is now Israel, the hatred for the State of Israel still resonates fresh in their memory (Despite the kingdom on a whole making peace with Israel and accepting the state as a legitimate entity). And it resonates in their children’s memory, as time goes on there will be few people left who left in 1947 and only their descendants. Should their descendants still be mad? Do they WANT to go back to the land or are they happy building a life in neighbouring Jordan? Again it is all about who is telling the story. I get why they cannot get along. I get it because I see a Greek Orthodox Church and a Catholic church atop the same holy place. Christians cannot even worship in the same place, and if they have the same beliefs and cannot share, why would those of different faiths and beliefs be able to share. The extreme that I found was while visiting the Holy Church of the Nativity in Bethlehem. The church sits atop the INN where Jesus was born. In the 19th century a stone wall was put into the inn, so that one side was for the Greek Orthodox Christians and Armenians and the other side was for Roman Catholics. Why cant these people share the same sacred space???? Again I am not a religious person, I am just a person, and I do not understand why they cant share. 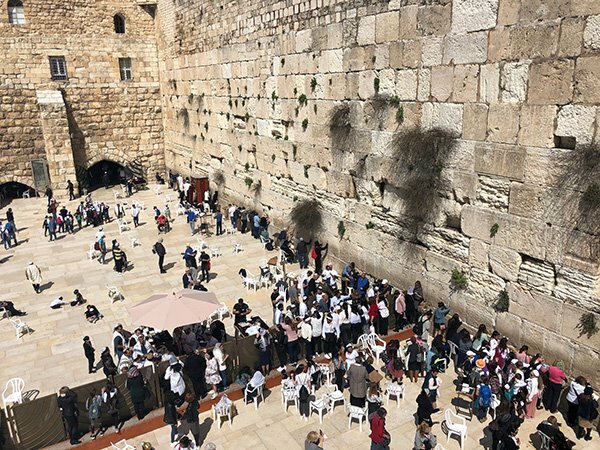 Perhaps the Old City of Jerusalem is an example of people of three faiths, sharind a very small space and respecting those around them. I feel like those who are Pro-Israel and those who are Pro-Palestine are the tips of the iceberg. But overall, most people who call this complicated region home just want economic stability and opportunity. I do not believe that an 18 year old Israeli doing military service in Palestine can hate these people. He is doing his job. Most Palestinians in the West Bank are extremely well educated and in modern cities like Ramallah, they are prospering. They want to feel free, to travel freely in their land and they want peace and togetherness. And Israel wants its borders to feel safe, they have every right to protect their borders. As a traveler, I do not know how to fix this region. But I thoroughly enjoyed visiting it and all of its complexities. I hope to return soon and continue to narrative on why I am so confused in this region that is so important to so many people!